I have enclosed a photo of the spots on the leaves of my basil plant. Could you please help me identify it and suggest a remedy (preferably organic)? 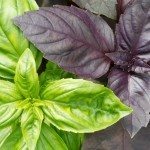 I am a novice gardener and would really appreciate your help. Thanks in advance. I believe this is a pest issue, Aphids most likely. Neem Oil can be used to treat edibles.